The folks at Avalanche have been busy little bees lately. The company headquartered in Stockholm, now owned by Nordisk Film, released Just Cause 4 in late 2018; they’ve continued working and updating theHunter: Call of the Wild; they’ve announced co-developing Rage 2 alongside id Software. However, truth to be told, theHunter: Call of the Wild is technically developed by Expansive Worlds, a subsidiary of Avalanche. On the other hand, Generation Zero is the first game developed and self-published under the Avalanche umbrella. Released two days ago on PC, PlayStation 4 and Xbox One (you can find our review penned by Chris at this address), the game brings the studio’s signature open world design to a cooperative environment and a brand new setting, where Sweden is invaded by hostile machines in the 1980s. We were able to interview Avalanche’s Emil Kraftling (Game Director) and Paul Keslin (Product Owner) to learn about Generation Zero’s development, the post-launch plans and the developers’ opinion on the hottest topics in the industry from Google Stadia to the Epic Games Store. Enjoy! What were the inspirations and influences for this rather unique setting? A lot of the inspiration behind the game stems from our development teams own experience growing up in 1980s Sweden. With the Cold War drawing to a close, and the country as a whole preparing for the possibility of a mass invasion or attack, the bunkers as well as the general aesthetic of the 80s left a lingering mark on them. Now that years have passed, that has morphed into a nostalgic one, something that the team, in turn, wanted to be able to share with the rest of the world. How big is the development team behind for Generation Zero and how long has the game been in the works at Avalanche? The team peaked in size at around 30 people which is a very small team in comparison to AAA productions. It is a fantastic team of mixed experiences though, ranging from many old AAA Avalanche veterans to entirely new hires with other development backgrounds and even some developers coming straight from school. They all share an immense talent and a real passion for the project however and we’ve had so much fun making the game. In the overcrowded market of co-op shooter games, how will Generation Zero stand out in your opinion? The game is really a labor of love for the team. Our memories have had an impact on everything from the look of the environment, the types of player apparel, the naming of people and locations and aspects of the background story. From a gameplay perspective, we see Generation Zero as “guerilla survival”, where you and your friends are not surviving against the elements, thirst or hunger, but against these strange machines. We want you to feel like an underdog, but then also provide you the tools, tactics, and environments to still gain the upper hand in any given situation, by use of stealth, cunning or your combat skills. And should all fail, we want you to feel like escape is a valid tactic. Living is winning, and you can always come back and finish the job later. How many missions are there in the game and how long would it take to complete them on average? We have several story arcs in Generation Zero that you as a player can choose to unravel as you play. Depending on your playstyle the game will take you a different amount of time to complete in comparison to your friends, but there is plenty to see and do in the game – so all we can say is that it will keep you entertained for a long time. Are there any chances you’ll add other modes later on, with survival and/or PvP elements for instance? As mentioned Generation Zero is a live game and the team already has some great ideas for what’s to come in the future. However, we’re also looking forward to working closely with our community and taking into account their feedback and wishes – if it is new features, new items or whatever else that they would like to see or do in the game. We see the live tail of the game as a close collaboration between us and our players. How large is the open world of Generation Zero compared to your other open world titles? It’s really hard to give exact size of the game world seeing as it consists of several islands, but in true Avalanche Studios style it is, of course, huge and it will take many hours for players to traverse it in its entirety. What are your plans when it comes to post-launch support for the game? The game is going to be a live service post-launch meaning that we are committed to supporting and expanding the game in many different ways. As mentioned earlier, while we have lots of ideas on how to do this, we really look forward to community feedback, which will help shape the upcoming content. Do you think Generation Zero could be a good fit for the Xbox Game Pass service? What do you think of this model in general? Xbox Game Pass has proven to be very successful for us in the past and we already have theHunter: Call of the Wild as a self-published title on Xbox Game Pass. We always evaluate each game carefully before doing any collaborations and will do the same with Generation Zero. With regards to the recent PC store war between Steam, Epic Games Store and Discord Store, what’s the position of Avalanche as an independent developer? We closely follow what’s happening on the market and make informed decisions once we feel the time is right. We’ve worked, successfully, with Steam for many years but are always open to meeting and discussing with new and interesting partners. At the end of the day, it’s about reaching gamers around the globe and being available on the platforms they know and love. In general, this means that we are both positive and excited towards the launch of both new platforms as well as new tech. As mentioned above we are always excited when new tech comes along! 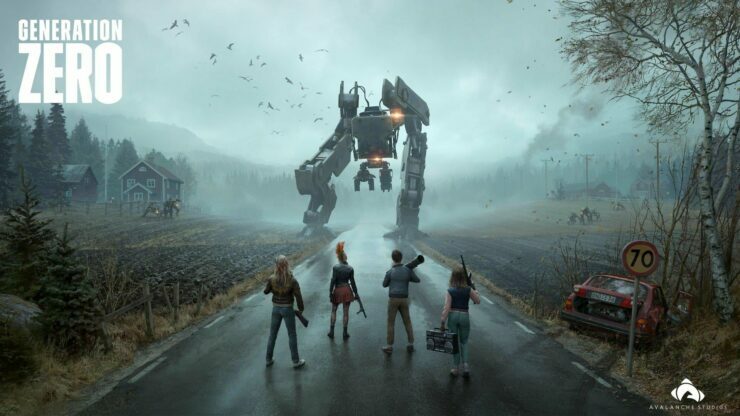 We did not work with any of the technologies in Generation Zero but if we look at this from a developer and gamer perspective (because at the end of the day, we’re both) we’re definitely interested to see how this evolves. You never know what the future might hold. Lastly, the cloud gaming revolution is almost upon us with the likes of Microsoft, Google and (rumored) Amazon vying to open this new market. How do you feel about it at Avalanche? These new platforms sound very exciting as they will help reach even more gamers worldwide – and more importantly, players of all levels, that play on vastly varying types of hardware, can now still enjoy the same games – so what’s not to be excited about?